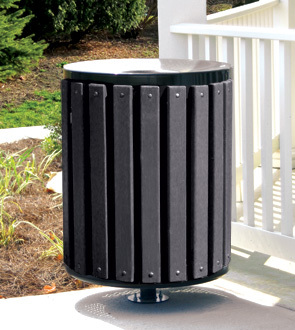 Keep your commercial outdoor are clean and inviting by utilizing this pedestal mounted trash receptacle with recycled plastic slats. The 2" x 3" recycled plastic slats are virtually maintenance free, do not need to be painted, and will not splinter, corrode or rot. Lid, Liner, and Pedestal Mount all sold separately. Flat Top Lid, Weather Shield Lid, Ash Urn Weather Shield Lid, and Pedestal Mounts (Surface & In-ground) are offered in polyester powder-coated (gloss & textured) color options as shown. 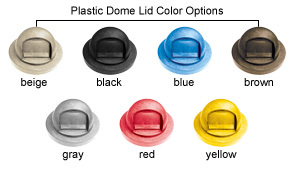 Recycled plastic slats and Plastic Dome Top Lids are available in their respective colors shown. These commercial trash cans are available with several versatile options designed to suit your needs. To make your ordering process simple please follow the easy 3 step ordering process. and Choose receptacle's slats & frame color. Select Model (B, C, D, E, F or G) and Choose lid color. (H) Enter the Quantity of the complete trash can(s) you would like to order. Trash can(s) base and lid will appear as separate line-items on the order form. The state of the art finishing process used on the trash receptacle combines the application of an 'Electrocoat Zinc Rich Primer' with a durable polyester powder-coat top layer to ensure every crevice and joint is completely sealed, providing full protection against	corrosion and weathering. Trash receptacles are finished in either a gloss or textured polyester powder-coat finish.